It’s been a couple of years since we’ve shared my sons’ bedroom. They have a love/hate with sharing their bedroom since they are polar opposites. My older son is fiesty like his mama with a short temper…also like his mama. Little bro is sweet and passive but the messiest kiddo you’ve ever met. My older is a neat freak, wakes up early, is always on time and loves to follow the rules. The younger fella, he just smiles and moves like a sloth. I decided I needed to make this small room as organized as I possibly could to keep the peace in this shared boys room. The solution? 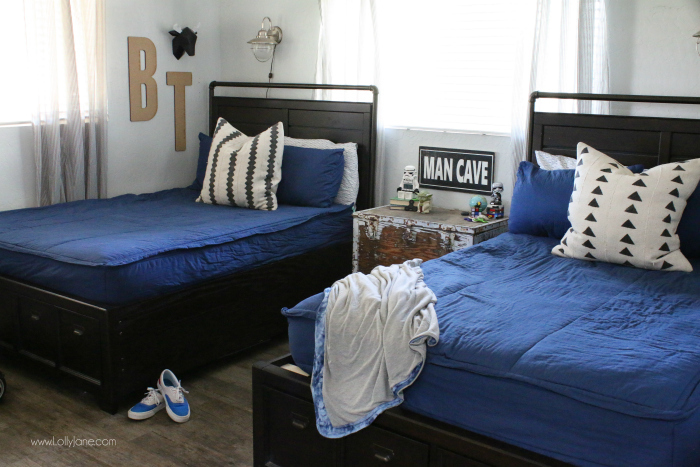 Beds with drawers and a closet makeover (coming soon). We also added our favorite zipper bedding for the fastest way to make your bed. NO.MORE.FIGHTS! Yaaaaaaay! We are in love with these outdoor lights. 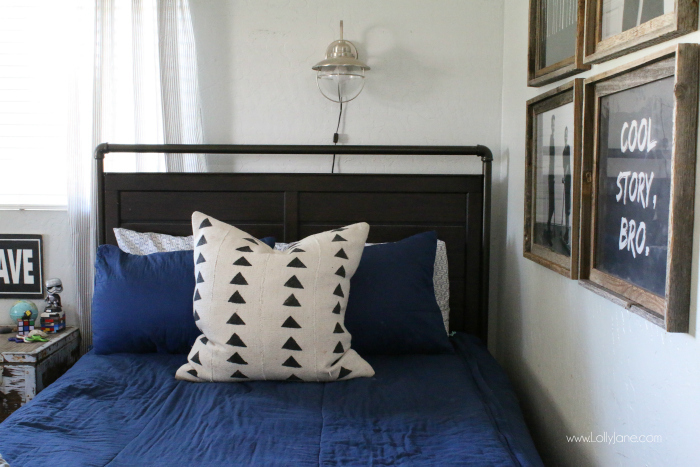 We used them in my laundry room makeover by adding a lamp kit to it. We did the same by adding a lamp kit but instead of having to unplug it like my laundry room version, we found one you can turn on and off in the actual cord. So convienent for the boys. Several years ago for one of our birthdays, Kristi and I spent the day thifting. I scored this old ammo trunk for $30 with big plans but alas, it sat outside since then. I finally drug it into the boys room as a nightstand. Right now they don’t use it for storage since they don’t need it but it’s always there just in case. 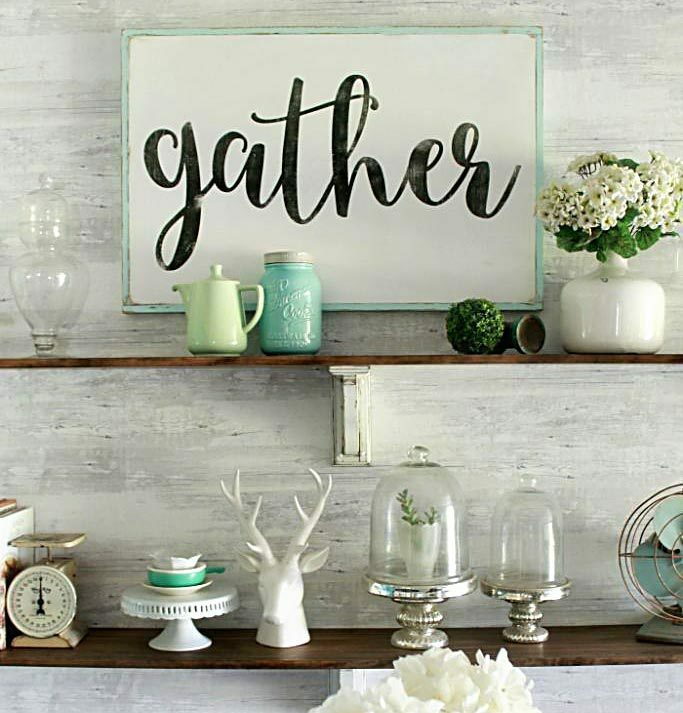 I love that they’re real wood and have the metal details to keep the vintage industrial feel. 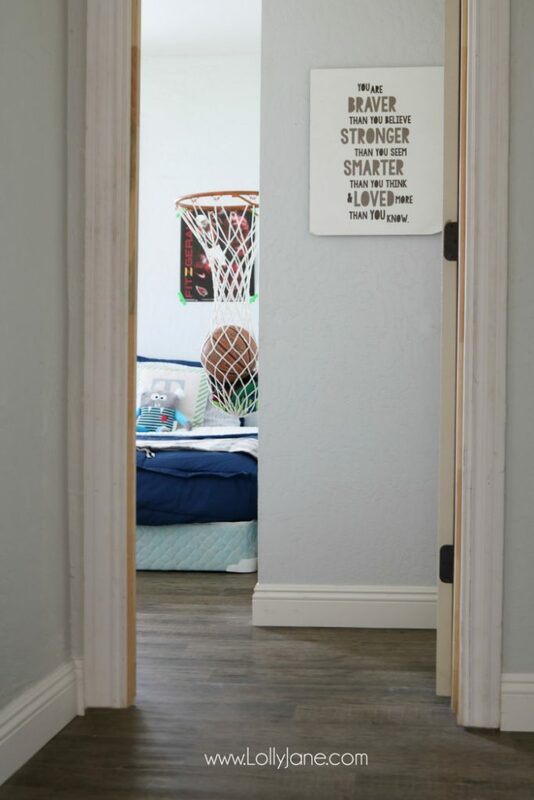 I searched over and over for boys wall decor ideas and loved the grouping of this boy’s room. I took a couple shots of my kids doing two of their favorite things: riding their pro scooters and playing lacrosse. 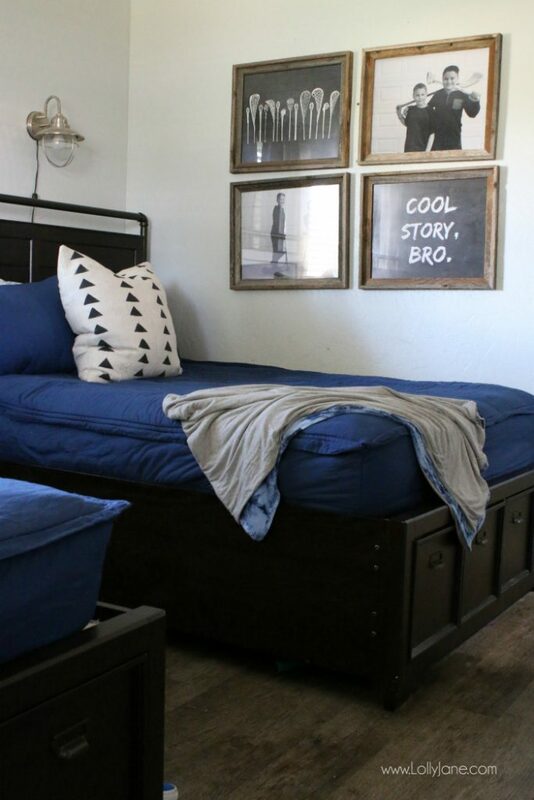 I typed up cool story bro and had it all printed at Costco then put them in a barnwood frame from Hobby Lobby. Easy. 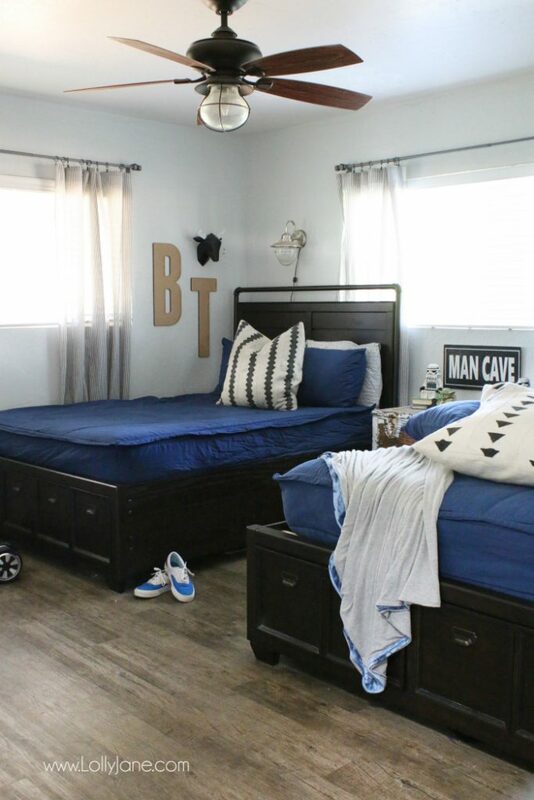 A new fan and flooring and this room is a lot more mature since the last time you’ve seen it! 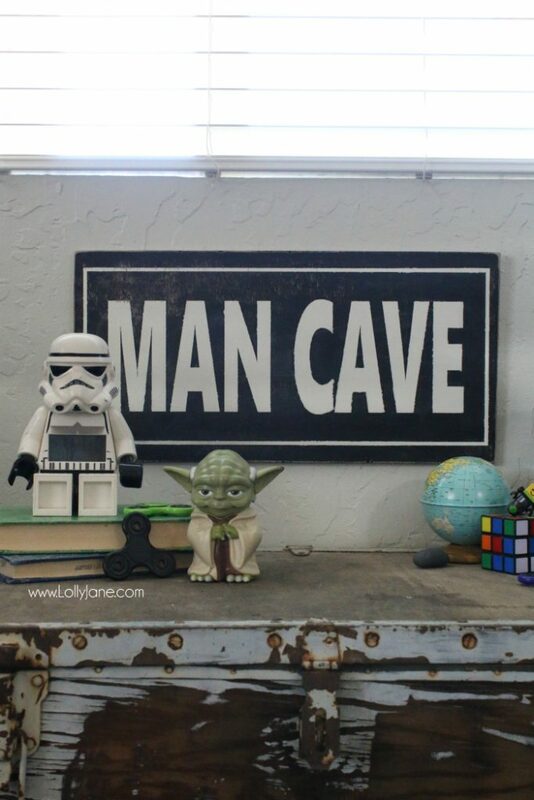 We made this little MAN CAVE sign from a scrap of wood. We’ll get it listed in the shop soon. Tell me, what are some ways you help keep your kiddos organized? Please PIN so your pals can see this too! 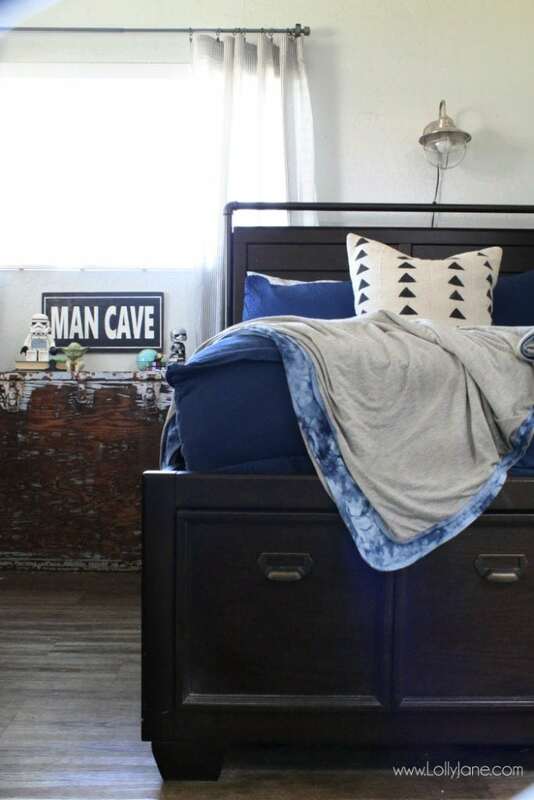 Looking for the right mattress for your growing kid’s bodies? You MUST get an IntelliBED, we adore ours! 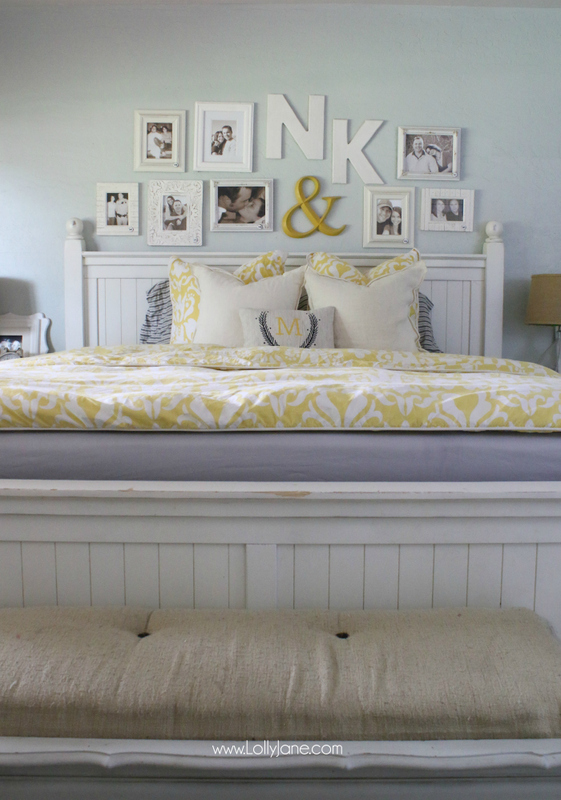 Master Bedroom Refresh, hello yellow! Previous Post: « We raised our 7′ drop ceiling! Such a big difference! 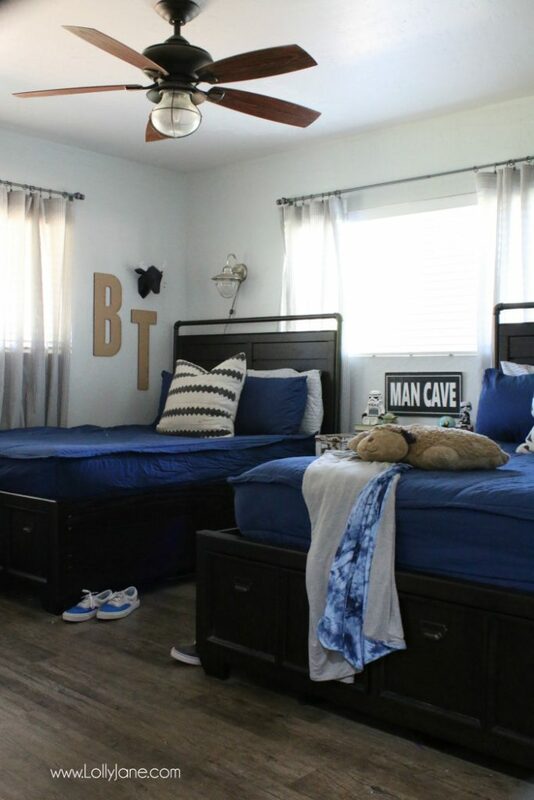 I love this shared boys room so much! 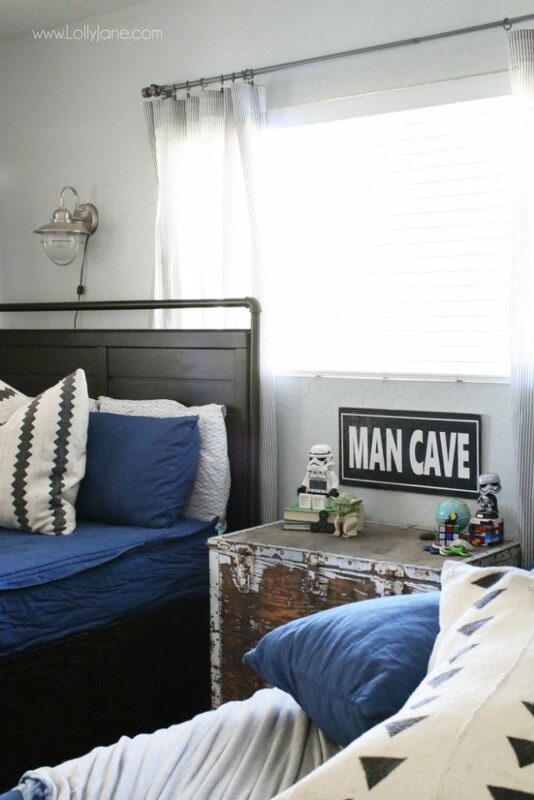 I’m so glad you were inspired by my son’s engineer prints in his rustic room! <3 I appreciate the link love! 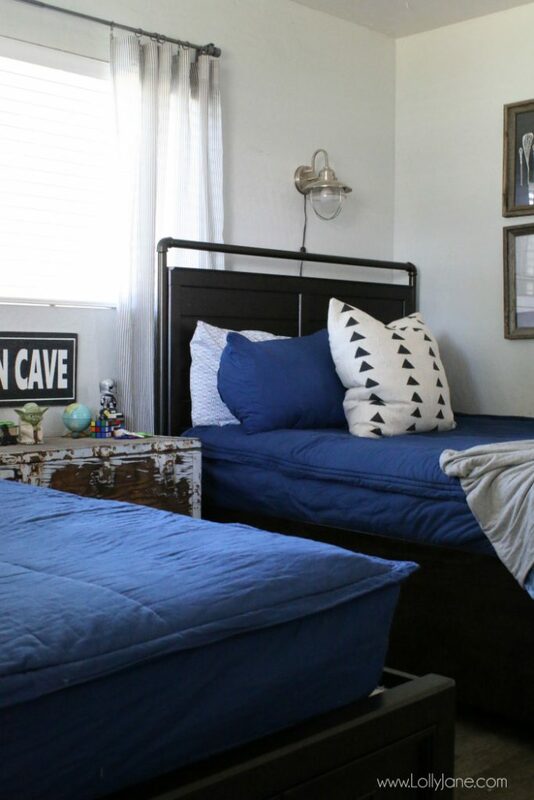 Your boy’s room is so cute, Rochelle!! Cute ideas. Any boy would be proud.